How do I change how I receive email from a list? Subscribers can choose from the available settings how they prefer to receive email from a list. The default setting is "standard (direct reception)", however, subscribers can choose another delivery option based on those made available by the owner. Select the list from the menu on the left. This left pane lists all mail lists which you are subscribed and/or own and the available options for that list. Click on "Subscriber Options" in the menu on the left. 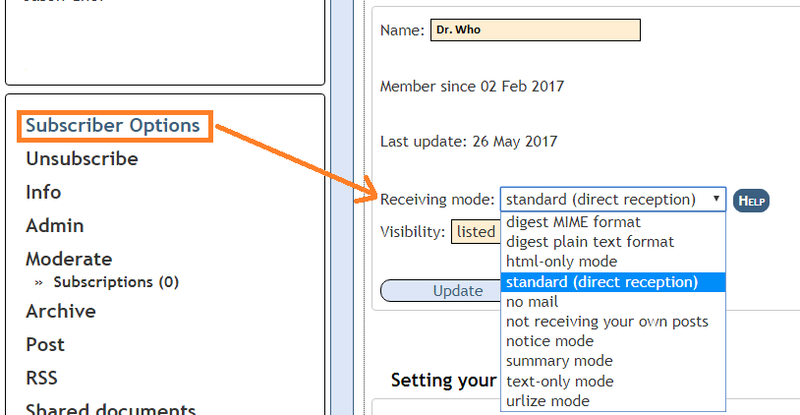 Click the list box next to "Receiving Mode" to view available options. Click "Update" to save your changes. Additional information about subscriber options are available at: What preferences do I have for my mail list(s)?